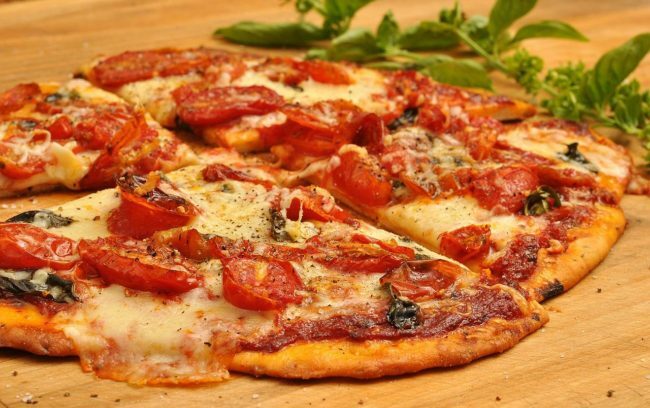 Traditional Italian vegetarian pizza with a thin crust, tomato sauce, mozzarella cheese and various toppings, this crunchy and delicious pizza is perfect to be served as a snack or appetizer or even as an anytime meal. Combine yeast with ¼ cup of warm water and 2 tbsp of oil in a bowl, leave aside for 10 minutes or until the solution turns bubbly and frothy. Combine flour with 2 tsp of sea salt in the bowl of a stand mixer fitted with a dough hook and blend at low speed for a minute or until well mixed. Pour yeast mixture into flour mixture followed by an additional ¾ cup of warm water while mixing constantly at low speed. Mix for 3 to 4 minutes or until the dough pulls together. Turn the dough over a lightly floured surface and knead for 6 to 8 minutes using the heel of your hand. Knead by pushing outward and pulling the inside edge to create a smooth dough ball, free of stickiness. Grease a large bowl with remaining 1 tbsp of oil and transfer dough ball into it. Turn over the dough ball so as to coat well with oil from all sides. Then keep, covered with a clean cloth at a warm place for 1 ½ to 2 hours or until double in size. Divide the dough into 2 or 3 equal size balls so that when you pat them into pizza circles they should be thin and not thick. Wrap each ball individually with plastic wrap and refrigerate until required. Preheat your oven to 200 degrees Celsius and line a baking sheet with aluminum foil. Place the prepared flatbread uncooked crust on the prepared baking sheet and spread marinara sauce all over leaving 1 inch from edges. Spread cheese over tomato sauce and finally arrange tomato slices and basil leaves on top. Bake in preheated oven for 12 – 15 minutes or until pizza is golden brown and the cheese has melted and is bubbling. Bring out of the oven and transfer to a serving platter. Sprinkle with freshly ground black pepper and mixed Italian herbs. Cut into slices using a pizza cutter and serve immediately.